How many times have you heard that being successful is all about setting goals? But, it may come as no surprise to learn there is a lot more to success than just setting your goals. Most of us, at some time, have been told that an essential part, if not the major part, of being successful is setting goals. If that was true, we would be much more successful at achieving our goals in life. In this article, we'll talk about why many people fail to achieve their goals and how you can be successful at achieving your goals...and your dreams. 1. What is a goal? A goal is a target that is achievable in measurable, attainable steps. It is more than just a desire or a need; it has an existence of its own. A desire or a wish is less tangible and is often fleeting. For example, who doesn't want to win the lottery with all its millions in prize money? Very few would not but, despite the widespread desire, it is not a goal. A goal is a desire, wish or need achievable by actions you can take. It is more than a mere wish or desire. Last time, in "5 Steps to Goal Setting Success," we discussed why the ability to achieve your goals is the true secret to success and important steps to take in order to overcome the obstacles and challenges that will, inevitably, come your way. To help lay the foundation for goal setting and achievement, it is important to, first, have a vision and strategy that works for you. This "visioning" and strategy process can take many forms, however here is one that I have found to be very useful. Many people think that goal setting is the true secret to success in any area of life. Although setting a goal may seem simple, achieving it is usually another question altogether. The ability to achieve your goals is the true secret to success! Why is that? Because you will never achieve your goals unless you: (1) know exactly what you want; (2) are passionate about your goal; and (3) have a solid, realistic plan of action. This is what marks the difference between nebulous dreams and wishes - and truly achievable goals! Many obstacles and challenges will fly right in your face when you're going after a goal. Here are 5 time-tested methods that will help get the success you deserve. 1. Know exactly what your goal is: Your first job is to discover exactly what your goal is. What will achieving that goal really look like? Be as specific as possible about exactly what your desired end result is. Your success will be a measure of your clarity - since an achievable goal plan cannot be created around a nebulous "dream." The end of the year is always a great time to reflect back and plan ahead. As you reflect on this past year, what were your two or three most significant accomplishments, breakthroughs, and/or achievements? You hear a lot of talk about the power that goal setting has on your ability to achieve success as you define it. There is no doubt that this is true, but it needs to go one step further. Having a goal setting process will not make you successful in itself. It is more important to have a goal achieving process. This month we share 7 key tips to set your goals in motion and help you reach the ultimate prize ... your goal! You don't need anyone's permission to fulfill your dreams. Trust yourself and give yourself permission to succeed. Having support from people whose opinion you value is a wonderful thing, but it should not be the criterion for whether you begin acting on fulfilling your goals or not. If you really desire to turn your ideas into reality, constantly floating them around and seeking the approval of people will waste your time and can kill your dreams. What will happen to your ideas if you don't get the approval of those whose permission you so desperately need? Nothing! 2. Don't wait for perfection. Goals / Purpose : Same Old New Year for You, or Will 2014 Be Different? I was thinking about New Year's resolutions and how few of them we actually keep. 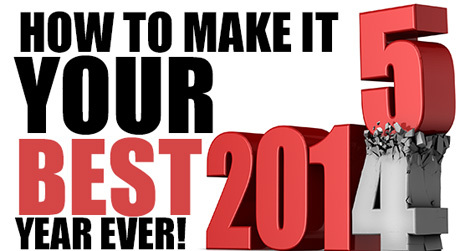 Did you know that 50% of resolutions are broken within the first two weeks of the New Year? And that by the end of January a full 95% of resolutions are abandoned? That's right...only 5% of New Year's resolutions are kept even beyond January! Bottom line: The majority of resolutions fail because only a small percentage of people with resolutions ever do something about them. Don't let this happen to you. Don't let 2014 be the same old New Year...where you start off with renewed energy and wonderful ideas only have them end up on the "95% scrap heap." Whatever your goals are for 2014, I urge you to put them into action. Don't wait anymore. Action creates results. John is reflecting on the last goal that he set for himself. Everything started well - he was making progress, he felt great about what he was doing, and he was excited about future possibilities. But then things unraveled. The goal took longer to complete than he thought it would, and he became discouraged. And, because he didn't stop to look at what he had achieved, he lost his drive and focus. Before he knew it, the goal - and the opportunities it would have brought - was forgotten. Let's look at some common mistakes that people make when they set goals. Learn how to recognize these mistakes, so that you can avoid making them yourself! For instance, if your goal is to run a marathon, it's wildly unrealistic to sign up for one next month, unless you've already done several months of training. Or, if your goal is to become CEO of a company, but you have no experience, this goal might not be practical - at least not yet! Goals / Purpose : What are Your Goals for Next Month? Many executives and business owners try to chase too many targets at once and end up overwhelmed rather than focusing on their business. They spend all of their energy carrying out daily tasks leaving little time for the most important part of their day - their own business! Being a business owner often means wearing a number of different hats. How many of you act as the CEO, the general manager, the accountant, the salesperson, the computer technician, the marketing leader, etc.? Sound familiar? To avoid this, spend some dedicated time next month focusing on the strategies which will be most helpful in growing and improving your business. In order to grow and succeed in your business, you first need to have a crystal clear idea of what you want to do and where you want to go. In other words, have you defined your objectives? And more importantly, have you put them in writing?